The Christian African Relief Trust (CART) is run entirely by volunteers both in the UK and Africa. CART sends goods from the UK to Africa to relieve extreme poverty and to support the development of educational, medical and employment opportunities. Goods are distributed amongst the most needy, regardless of caste or creed, by local organisations of proven ability and trust. Distribution reports are sent back to the UK. CART shipped the shoes collected at Keston Primary School and Little Kickers East Surrey to The Coalition for Change / School PTA in Wa, Northern Ghana. These children attend The Universal Street Academy in Accra, Ghana, run by an organisation that aims to take the children off the streets and into a classroom where they can be educated and fed with one meal a day at no cost. The organisation runs a school from 7.30am to 3.00pm Monday to Friday for children aged 6 to 16 years. In July 2015 as well as receiving an education, they also received a pair of shoes. http://ankomaoutreach.yolasite.com is a non-for-profit organisation who support a small village in the Kwahu District in Ghana, helping the community to become self-sufficient and fight the poverty they face each day. Their work spreads throughout the village and they have launched several different projects in Ankoma : teaching projects, health projects, agricultural projects, sports projects, clean water campaigns, building projects and performing arts projects. Ankoma Outreach held their first Sal's Shoes distribution in April 2016. The majority of children who received a pair of shoes had never owned a pair before. Some shoes were distributed to children who work on farms to help provide food for their families. This was for their safety and protection. The children had been working on a rough terrain with no protection to their feet. In April 2016 http://ankomaoutreach.yolasite.com held a Sal's Shoes distribution. The shoes were distributed to children, who walk for around an hour to get to school, and then an hour back, normally in bare feet. Children in the village of Agent Quanta received Sal's Shoes in April 2016. These children walk two miles to school in the neighbouring village every day. They are the first to arrive and the last to leave. They live without electricity and face a long walk daily to fetch water for their families. In August 2016, Sal's Shoes found new feet with http://ankomaoutreach.yolasite.com in the village of Kofininya, in Ghana. Kids from this village had been walking 2 miles barefoot across rough terrain to schools in the neighbouring village of Ankoma, and then 2 miles barefoot back home again at the end of the day. In February 2017 Sal's Shoes were finding new feet in the communities of Abisu and Ankoma in rural Ghana. 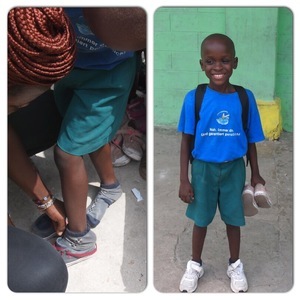 In October 2017, shoes donated by pupils at http://www.eastsheen.richmond.sch.uk, http://www.stanley.richmond.sch.uk, http://www.stsaviourscofe.org & http://www.stmaryscofe.org have just started finding their new feet with @akwaabavolunteers in schools and on football pitches in Ghana, West Africa. In October 2017 Sal's Shoes football boots did a celebratory dance before getting back on the pitch in Ghana thanks to http://akwaabavolunteers.org.uk. Sal's Shoes found new feet in Ghana in October 2017 thanks to http://akwaabavolunteers.org.uk. Our greatest natural resource is the minds of our children [Walt Disney] There is a direct correlation between education and poverty; education can mean a way out of poverty. In many countries although the education system is free to access; many children cannot go to school if they do not own a pair of shoes 👣 A pair of school shoes is a pair of school shoes wherever they are in the world 🌎 Sal's Shoes donated in Gibraltar as part of our Toe to Toe initiative found their new feet in November 2017 at Nkwatanan Presbyterian Primary School and Ahinase Roman Catholic Primary School in the remote Kwahu East region of Ghana with https://www.buildaneducation.org.uk. Sal's Shoes went back to school in Ghana in November 2017 with http://ankomaoutreach.co.uk 🌎 Shoes donated as part of our Toe to Toe initiative by the pupils at East Sheen Primary 📕 Eldwick Primary School 📗 Federated schools of St Mary’s and St Saviour’s 📘 & Stanley Primary School 📙 went back to school at 3 primary schools in Abisu and Ankoma. Thank you for playing a part & making a difference. In January 2018, thanks to https://www.buildaneducation.org.uk, Sal's Shoes were finding their new feet at 4 primary schools in the remote villages of Oframase, Oworubong Atifi and Oworubong Odumase in the Kwahu East district of Eastern Region, Ghana 🇬🇭. The Street 2 School Soccer Programme is a community sports development initiative which provides both football and education to local youth. S2S works by providing football training sessions, matches and homework club to reintroduce disenfranchised youths back into the school system in addition to offering them continued educational and vocational support. This month S2S hosted a ten team tournament to celebrate the hard work of their players both on the pitch and with their education and to bring the community together. Future Leaders UCC helps children who would, under their current circumstances, be unable to attend government schools as a result of a lack of financial means and/or developmental needs. S2S works by providing football training sessions, matches and a homework club to reintroduce disenfranchised youths back into the school system in addition to offering them continued educational and vocational support. Through this vibrant and inspiring community programme their goal is to continue allowing as many underprivileged children as possible to gain proper access to an education into adulthood. In January 2019, thanks to http://ankomaoutreach.co.uk Eddie and others in his community in Ghana 🇬🇭 received a pair of the smallest of Sal’s Shoes today. Eddie is about to turn 3, he is suffering from severe malnutrition and a few hours after receiving his shoes he was diagnosed with malaria.